Many HomeVision users have been asking for the posibility to perform multi-line copy/paste operations. HomeVisionXL provides this feature. The user can select multiple lines in the action editor and if the selection is a consistent piece of the code, it will be possible to cut/copy/delete that piece of code. A consistent piece of code is a sequence of code lines that contain neither or all parts of a matching set of If/Then/EndIf, If/Then/Else/EndIf and/or Wait/EndWait commands. Just like most modern text editors, the HomeVisionXL action editor has the ability to undo and redo changes. Sometimes it may be desirable to add an else clause to an existing If/Then/EndIf command. With the multi-line copy facility it is already quite easy to just copy the condition part and the then-part to a new If/Then/Else/EndIf template, but there is an even easier way. The context menu that pops up when you click the right mouse button on the If command will show the appropriate option to "Convert to If-Then-Else-EndIf" or "Convert to If-Then-EndIf". When removing the else clause from an If/Then/Else/EndIf command, any commands in the Else section will be placed after the EndIf code line. On code lines that reference other objects that may have actions attached, the context menu contains an option to edit those actions. If a comment spans multiple lines, the whole block can be edited all at once. This makes it much easier to reformat the text after adding a few words early-on in the description. During action development it can be useful to temporarily disable part of the code. 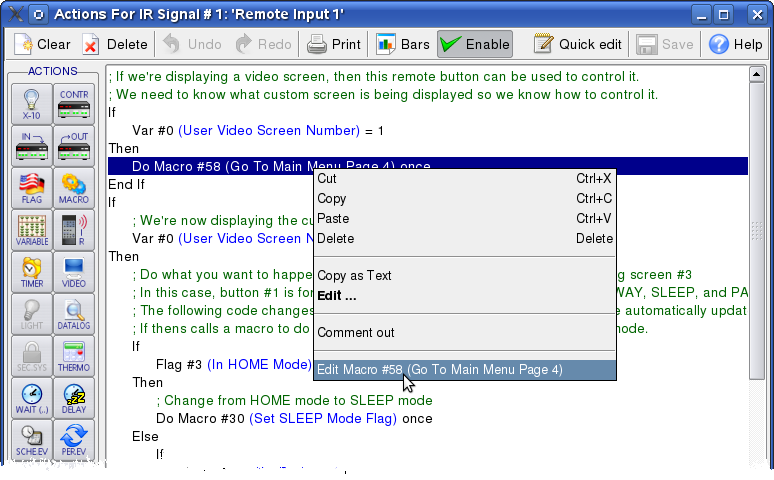 The context menu contains a "Comment out" option to convert a command to a note. This option will convert the command into a note describing the command. The original command is hidden in the note in such a way that it will not be visible. Notes created in this way can later be converted back into the original command. When the text of the note is edited, the hidden command is lost and it will not be possible to convert the note text back to a command again. It is possible to open editing windows for different actions at the same time, making it very easy to copy pieces of code from one action to another. In complicated actions it may become difficult to keep track of which "If" some piece of code belongs to. On demand, colored helper bars can be displayed that indicate the span of an If/Then(/Else) block. While writing actions it may be helpful to get the current value of some of the used objects. The HomeVisionXL action editor will display this information in a tooltip for the objects used in the code line the mouse pointer is pointing at. Some tasks require two pieces of code that do almost exactly the same things, but opposite. For example: switching on lights when it gets dark and switching the same set of lights off again when it gets light. Copying the block of code is easy with the multi-line copy/paste feature, but then the commands need to be changed from switching a light on to switching it off. Doing this one by one by bringing up the command edit window, selecting the correct command and clicking OK becomes tedious quickly. With the quick-edit feature multiple commands can be selected and changed to a related command in one operation. Even for changing single commands this way is faster than using the normal command editing screens.